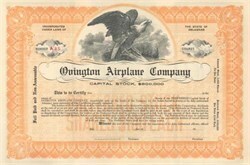 Beautifully engraved unissued certificate from the Ovington Airplane Company. 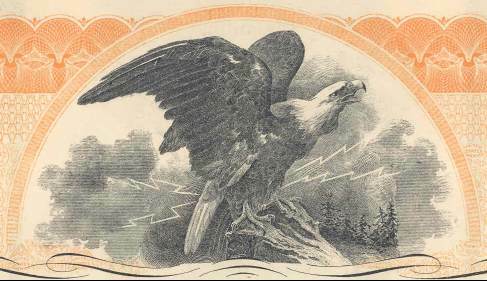 This historic document was printed by the Brown-Green Company and has an ornate border around it with a vignette of an eagle perched on a rock in the middle of a forest. Light water stain on bottom border. The first air mail flights and the passenger carrying planes from transcontinental to transoceanic remind us that the first official air mail pilot in the U.S. was from Newton! In September, 1911 the big event at the Harvard-Boston Aviation Meet at Squantum Airfield was a $10,000 inter-city flight competition sponsored by the Boston Globe, The flight rules of the race required the four contestants to fly a circuitous route over the cities of Nashua, Worcester, Providence and back to Squantum. One of the competitors was Earle Ovington of Newton who was piloting a 100 horsepower Bleriot monoplane which he had learned to fly at the Bleriot Aviation School in Pau, France in 1906. He was easily the winner of the race, the only one of the four contestants to complete the 174 mile course. Prior to his training as a pilot Ovington had worked as an engineering assistant to Thomas A. Edison in New Jersey. After his return from France his reputation as a skilled pilot began to spread throughout the northeastern United States and he began to win a number of prizes at air meets. He was the first pilot to fly over Boston. At a large meet in Garden City, Long Island, New York an attempt was to be made to fly the first air mail in the United States following the lead of the British two weeks earlier. Postmaster General Frank Hitchcock had attempted in November 1910 to fly a plane on a ship-to-shore flight to demonstrate a method to expedite the delivery of mail , etc. from arriving and departing transoceanic vessels. However, bad weather thwarted one attempt and a broken propeller, another. Now at Garden City another attempt was to be made. Two prominent British flyers were approached to participate but declined politely when they learned that there was no remuneration. However Earl L. Ovington volunteered to make the flight. Although he flew a Curtis-type pusher biplane at Chicago he preferred his tractor-type monoplane and came to Garden City with an American-made Bleriot Queen... named the Dragonfly and bearing a bold number 13. Postmaster Hitchcock was disappointed with his choice as he expected his mail carrier's plane to be a two-seated with one seat reserved for him... The Bleriot was only capable of carrying one person. Not wishing to surrender the distinction of being the first air mail carrier he reported "I immediately decided to postpone the flight until a two-seated plane could be procured." Eventually Hitchcock relented and he said, "I handed the pouch to Ovington ...and permitted him to proceed on that first flight alone. For a time I felt rather deeply disappointed of thus failing in my ambition to become the first (air mail) carrier of record (in the United States). Afterward, when I became better acquainted with Earl Ovington and began to appreciate his fine qualities...I cease to begrudge him the honor he wrested from me." Ovington took off on September 23, 1911 with a load of 640 letters and 1,280 postcards in a mail bag tucked between his legs - the first airplane carry of United States mail authorized by postal authorities. Ovington flew to Mineola, about three miles away, where, as agreed, he dropped the bag in a prearranged spot to waiting postal officials. The drop landed on time and on target, but unfortunately the bag broke on impact with the ground, scattering the mail hither and yon. After a scramble, all the letters and cards were retrieved and sent on the way via regular postal channels, all of them bearing the cancellation "AEROPLANE STATION No.1 - GARDEN CITY ESTATES, N.Y." For this feat Ovington was awarded the title "AIR MAIL PILOT No.1." The editor of our local TOWN CRIER must have been interested in the "Birdman" (as Ovington soon came to be known) as some of his other exploits often appeared in his paper - such as this one in the October 6, 1911 issue: Postmaster General Hitchcock has issued an order authorizing Earl L. Ovington of Newton Highlands, to act as aerial mail carrier, and has directed the postmaster of New York to dispatch letters by the aeroplane route, from New York to Chicago and San Francisco. The route which is officially "Route 607001" is the longest messenger route ever established. Ovington will carry a specially constructed mail pouch with a number of letters in it, when he endeavors to cross the continent." Unfortunately, the engine of Ovington's new cross-country plane "proved inadequate for its task" and the route was not attempted. Ovington, however inaugurated an era that would continue until 1916, a period when letters were flown experimentally and without expense to the Post Office Department. In the March 29, 1912 issue of the TOWN CRIER there is an account concerning an illustrated lecture Mr. Ovington gave at a local church of some of his "thrilling experiences." At present he is at work on a hydroplane of his own invention ( Ovington Airplane Company ). The machine when completed is expected to fly through the air and also through water. The hydroplanes that are used today are not able to alight on land but the one being constructed by Mr. Ovington will descend, without fear of damage, both to dry land or into the sea. In other words it will be a flying machine and motor boat in one. Whatever happened to Ovington's hydroplane or the balance of his birdman career we do not know. We do know that at the same time he was dabbling in aeronautics he was venturing into another field, strangely enough described in a little book of reminiscences published in 1947 by the former editor of the TOWN CRIER, John Temporally of Newton Upper Falls. About 1910 the rather unusual stucco structure on the corner of Commonwealth Avenue and Irving Street was built by Earl Ovington. He used it as his Vitality laboratory from which he mailed cultures for souring milk to clients. Promotion of sour-milk (semi-buttermilk) as a beverage was founded upon the belief that Bulgarians gained health and a ripe old age because of their imbibing quantities of it. Mr. Ovington, who learned to fly at the Bleriot School in France in 1906, sold the Vitality laboratory to J.W. Crewel; he in turn sold to Dr. Turner, who moved the business to Maine." Mr. Ovington eventually retired to Santa Barbara, California. He flew the mail only once again after 1911, before his death in 1936. He and Frank Hitchcock joined in a 20th anniversary round-trip flight between Los Angeles and Tucson, Arizona with the letters they carried bearing the signatures of both men.